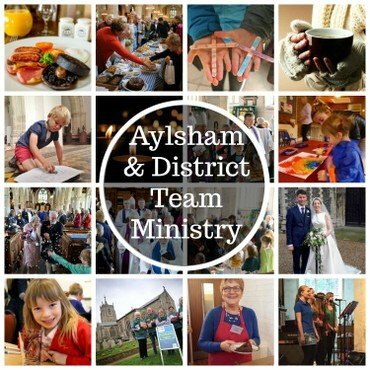 The Aylsham & District Team Ministry is made up of 16 unique and individual parishes, centred around the Market Town of Aylsham which is located halfway between Norwich and the North Norfolk Coast. The Vision for the Team, as we begin this first stage of creating sustainable rural ministry, focuses on "Discover God; affirm uniqueness and celebrate interdependence." The three-fold nature of the Vision has God at the centre as we deepen our understanding of the relational nature of the Trinity; at the same time, affirming both the uniqueness of each member of the Team and each individual community and celebrating that through working together, we are stronger and are more able to sustain and grow the life of the Church. Members of the Ministry Team have both pastoral responsibility for a group of Parishes and take the lead on an area of ministry & mission across the Team. A collegiate heart is at the centre of the Team Ministry. It is not about one church or one person being at the centre, but how co-operation, community, service, collaboration, and partnership can help us deliver afresh the Good News of Jesus to our different communities. There are things that we can do more strongly and efficiently together, but there are also things that we can do individually but in a supportive and affirming framework. Aylsham and District Team Ministry is a network of churches; journeying together; sharing our stories, resources, and burdens; creating sustainable ministry in our rural parishes which are welcoming, Christ-centered and rooted in our communities. The Team Ministry was informally launched on 1st January 2015 but grew out of Deanery discussion over the previous two years, and through a partnership between the previous benefices of Aylsham and Cawston since 2012. The Team Ministry 'experiment' ran alongside formal Pastoral Re-organisation over 18 months. Our success in bringing parishes together led to other Parishes joined the Team and early in 2018 we celebrated the formal creation of the Team. Cawston, Heydon & Haveringland join the Team & new House-for-duty appointed to work as Assistant Priest. Assistant Priest leaves as we look to appoint a new full-time Team Vicar to the Cawston Group. Twelve Towers Festival launched with over 200 events being held in our churches celebrating the life rural church. Revd Peter Chapman joins the Team as Team Vicar (Designate) of the Three Churches Group. Service of Celebration lead by the Bishop of Lynn & Archdeacon of Lynn to mark our coming together as the Aylsham & District Team Ministry. Discussion begin with Scottow Parish regarding joining the Team. Revd Deb Cousins appointed as Community Priest & Team Mission Enabler to work across the wider Team to promote mission in our rural churches. Second Twelve Towers Festival held across our 16 Churches.